Gentle Giant has posted their first Star Wars exclusive for San Diego Comic-Con and it's available for Premier Guild Members to pre-order now! 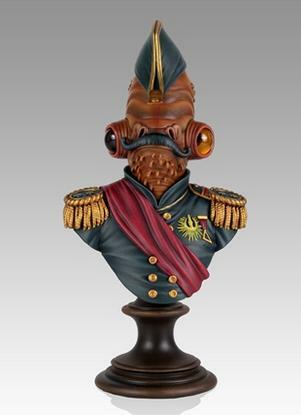 Limited to only 500 pieces, “Magnitude” An Admiral Ackbar Mini Bust, is based on the artwork by Steven Daily seen here. The mini bust is at 8” tall and comes in a screen printed wooden box with a 4 x 6 limited edition lithograph print by Acme Archives.